Home 2011 Philippine Peso Bills BSP Central Bank of the Philippines money new Philippine Peso Bill designs new Philippine Peso bills Philippine bills Philippine money Philippine Peso Bills Php The New Philippine Peso Bill Designs! The Bangko Sentral Ng Pilipinas (BSP) already launched the new designs of our Philippine Peso bills. And it was already signed and approved by President Noynoy Aquino. Do you already see these brand new looks of our Philippine peso bills?! Or do you already owned one of them?! Well if not yet, I will share with you all of them! Are you ready? What can you say about our new money?! Do you like their new designs?! 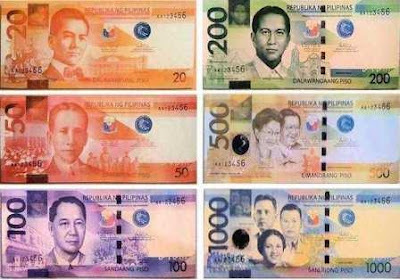 Actually the six Philippine bill denominations namely the Php20, Php50, Php100, Php200, Php500, and the Php1,000 were all have new designs. The different heroes who represented each money were still in their corresponding bills. The main different that we can notice in these new moneys is the appearance of the heroes. Yup, they all looks younger! In Php500 bill, the 'Mother of Democracy' Mrs. Corazon Aquino finally joins her better-half Sen. Benigno 'Ninoy' Aquino. They two truly gave one of the biggest contributions in the history of the Philippines! So in this particular peso bill, their good deeds were being appreciated! Aside from the new appearance, another distinguishing characteristic of these new moneys is the tiny replica of the heroes in their upper left corner. According to the reports, these new designs were more secured and more protected. They cannot also be easily destroyed! And at the back side of these new bills, new designs showing different Philippine scenes and cultures were featured! What more can you say about our new Philippine peso bills?! Do you like them better than our previous designs?! It said that these new bills will be launched this 2011. Our previous bills were gradually phasing out!